Karl Keffer was a founding member of the PGA of Canada in 1911. 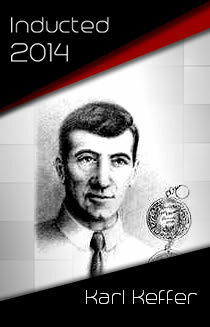 He sat as Honorary Secretary-Treasurer from 1914-1928, Captain from 1934-1937 and President from 1938 to 1940. Keffer was also a two-time winner of the Canadian Open, winning in 1909 and 1914. With his national open win in 1909, he became the first (and only) Canadian-born golfer to win the championship. Keffer was inducted into the Canadian Golf Hall of Fame in 1986.